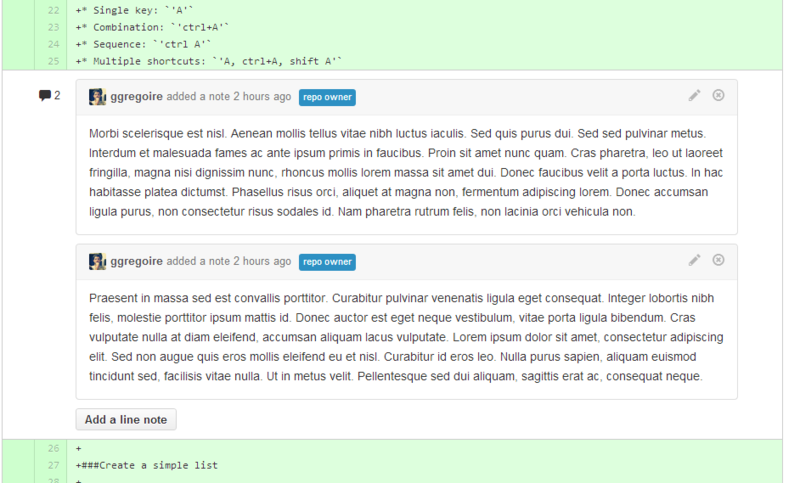 I just read the amazing question Emerging UI trend: comments in the margin - pros and cons?. I noticed this trend of putting the comments on the side of the documents (Google Docs is maybe the initiator, I'm not sure). So my opinion about the comments in the margin is they aren't made ​​to have a good discussion. That is a paradox because if I use an online collaborative document maker, I want to discuss with the others about what I'm writing. This is a central feature for me, not a bonus on the right side. So the comments inside the document seem better for me. But that is not easy. 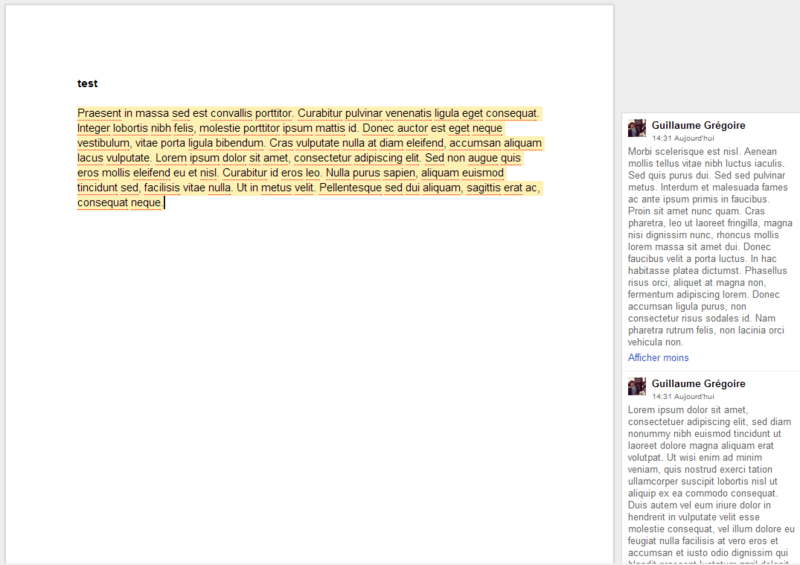 Mix document's content and comments can give a terrible stuff where content becomes unreadable and comments too. Firstly, what is your opinion about margin-comments and inside-comments for online collaborative document maker software (gdoc and the others)? Secondly, do you have any real good examples or any advices, approaches, good practices about comments at the heart of a document? I found 2 examples that I can show you. I don't really like. The difference between the content and the comments isn't enough obvious (just a div floating inside the document with a simple border and the user photo). Also the comments are nested into each other to make a hierarchy and I know they are pros for this way (tons of blogs and forums use it still) but I always found it hard to follow a discussion. I prefer the chronological approach with quotes and mentions (@username). Perhaps it would be better to limit the comments after the lines or at the end of the sentences or the paragraphs for better readability. I don't have any good example now, so I'd write just my opinion. Based on your text, examples and what I've seen, we can talk about three things or options, bottom comments, side comments and inline comments. This kind is the most intuitive since it's the mechanic that we are used to, it's also a similar visualization to other systems where people interact, like forums, question an answer sites, messaging systems, etc. This option seems more suited for comments related to the whole content, conversations started by the original text, multiple citations and long arguments. When I say conversation, I mean the kind of exchange between readers of the document, may be with diverging opinions, may be complementing, that doesn't really matter. Being on a side, puts the comment at the same level as the text, that may generate a problem since may seem that the comment is an annotation or a very specific comment regarding the paragraph or idea that is right next to it, and most probably it's not since they are just being presented from top to bottom, like the text itself. That being said, comments about specific paragraphs would make a lot of sense visualized this way since they would be immediately read. Another potential pitfall with this, is that those comments may distract the reader from the main content, the text that the comments are about. This kind of comments could be well suited in a formal environment, analyzing parts of the text, adding more information, like footnotes do, etc. But on a blog post, for instance it may be a big distraction since many comments may be "juicy", or interesting, or spark curiosity for any reason, and that would detriment the original idea/text. This comments are the most specific kind, since they allow the user to write the comment for the specific set of words that he wants to write. But it's also the one with the most amount of problems, in my opinion. First, lets consider the visualization of the comments, they will disrupt the original text if the presentation inserts them on the text. even activated by hover mechanisms. They will cover the text if presented as a layer, which is not too bad, except that you can not move the comment to read the text again and see the relation. Second, consider the extension, a short comment would be perfect on this style, but a long one would feel like a loud person arguing against the original author, or somebody with a side joke or comment that is stealing the audience. Third, there is no way to have a reasonable progression, or discussion, or rebuttal of the comment without the visualization and extension problems. It would feel very distracting. This kind of comments are very well suited for short corrections or comments; just a few words. 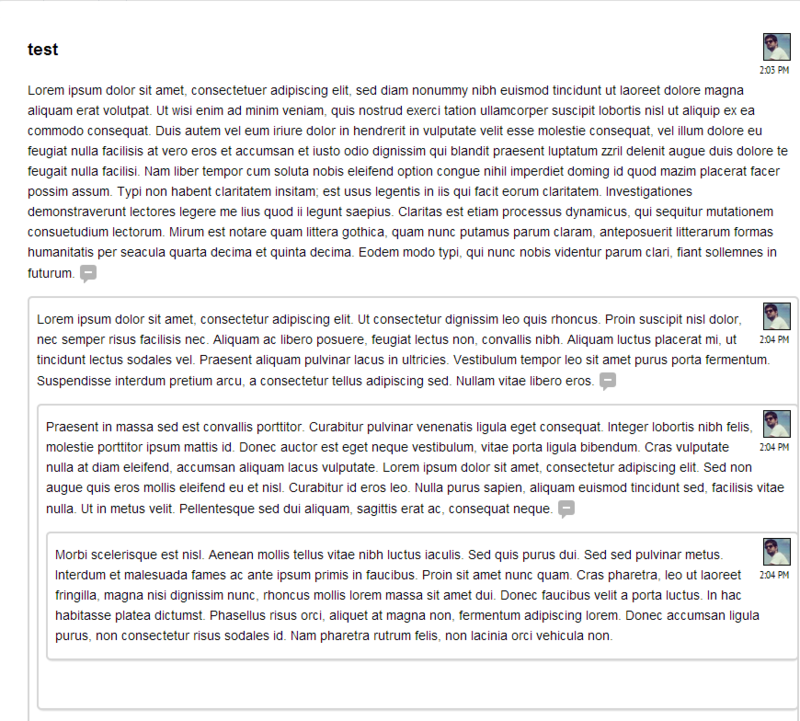 So, in conclusion, depending on the nature of the original text, character of the site, and expected length of the comments, you can choose one or the other, but each has it's own unique place. I love the way to comment on Medium website. It's a side comment but when you read comment they move to the middle of the web page. I apologize if I do errors in english, I'm french. 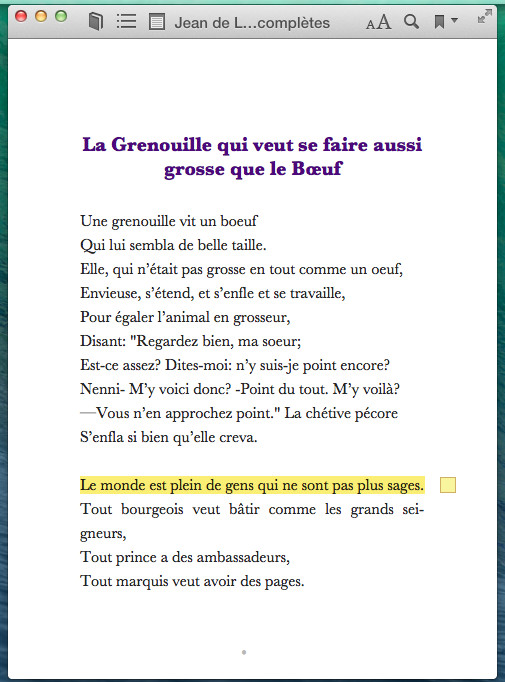 I think that Apple is doing it in an interesting way on iBooks, if you click on the yellow square a floating note that you can read and edit will come. Not the answer you're looking for? Browse other questions tagged website-design usability gui-design readability comments or ask your own question. Is it a good idea to have a homepage with multiple templates that alternate on a periodic basis? Limited threaded system for comments? Should I remove post excerpt from our homepage mobile experience?